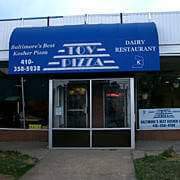 Located in the heart of the Jewish Community, Tov Pizza, voted Baltimore’s Best Kosher Pizza, is an icon of charm and soul. Tov Pizza opened in 1984 filling the need of a growing Jewish community. Since then, the store has doubled in size and expanded its menu. Our entire menu is available for eat-in, carry out and delivery. Cash only upon delivery; please make credit card payments when placing order. Our delicious 18” pizza with a mixture of toppings. Delicious sauceless pizza with a blend of 4 cheeses. Unless otherwise noted, sandwiches are available on your choice of white bread, wheat bread, rye, pita, wrap, bagel or roll. Extra charge for panini and subs (paninis are sub price). Assorted cheeses melted on panini bread with your choice of two vegetables, if desired. Sliced breaded eggplant with sauce and cheese. Served on a roll with lettuce, tomato and a pickle. Impossible Burger on a bun with a slice of American cheese, lettuce, tomato, onion & pickle. Served with a side of onion rings, french fries and a small fountain soda. Fried fish, french fries and salad. Pieces of fried fish mixed with salad in a wrap. Two scoops of tuna served with potato salad and coleslaw. One scoop of tuna on a bed of lettuce. Knosh (Pizza Knish)Open-faced 2-sided potato knish with pizza sauce and cheese. Pasta baked with sauce and cheese, served with garlic bread. Toppings available for $1 each. Sliced, breaded eggplant fried, topped with sauce and melted cheese. Served with garlic bread and sweet potato fries. Pasta baked with our own blended cheese and spinach, topped with tomato sauce. Served with garlic bread and salad. With sauce and cheese, served with garlic bread. Chumus, spanish eggplant salad, babaganoush, salad, falafel balls and techina, served with pita. Salad and falafel balls served with techina and a pita. 3. NEW JERSEY TURNPIKE SOUTH becomes I-295 S.
5. Continue until I-695 and take I-695 W/BELTWAY exit towards TOWSON. 6. TOV PIZZA is one block on your left.